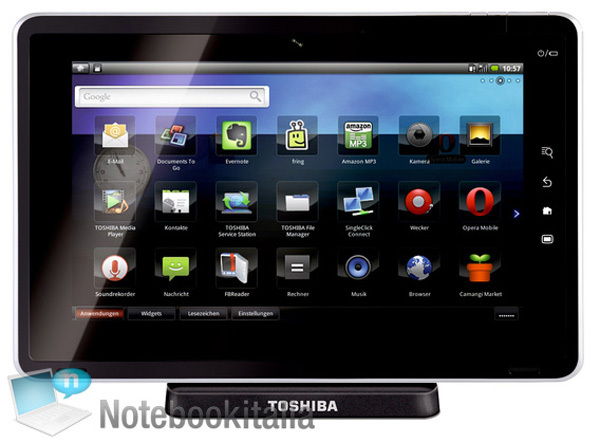 Notebookitalia received a tip regarding an Android-powered tablet form Toshiba that is rumored to be called the Folio 100. The device, which is rumored to feature relatively high-end specs, may be revealed at IFA here in Berlin this week, along with several other tablets, including the Samsung Galaxy Tab. IntoMobile mentions that "the Toshiba tablet is dropping the SmartPad name and is now rumored to be named the Folio 100, a moniker that is not to be confused with the now defunct Foleo subnotebook from Palm." TalkAndroid notes that the tablet's processor will likely be "the Nvidia Tegra 250 CPU, a dual core Arm A9 processor running at 1GHz." EuroDroid thinks that the Folio 100's "10.1″ screen should give Samsung something to worry about, what with it set to obliterate the Galaxy Tab’s 7″ screen." However, in my opinion, it really depends on what you are looking for. The Galaxy Tab is currently rumored to have a 1024 x 600 resolution display, the same as the Folio 100, which means that the Galaxy Tab would have a higher pixel density, resulting in a sharper, but smaller display. I'd prefer a a 7" display with higher pixel density, but that is just me. The battery life of the device has me more than a little concerned, as the 1020mAh battery seems to be even less powerful than many of the batteries we see in the newer Android phones. I always take issue with the small batteries incorporated into almost all smartphones these days. From what I read up, the iPad's battery seems to have between 5x-6x more mAh than the rumored Folio's battery. The Samsung Galaxy S I've been using for a while has a 1500mAh battery, surpassing the Folio's battery with almost 50% high mAh, while sporting a 4" screen. Let's hope some of these rumored specs are wrong, or are being changed as we speak. Otherwise, the tablet's battery life may be appallingly dismal. Check out more photos of the device at Notebookitalia. Oh Toshiba how far you've fallen.